I am taking the week off to fly to a family reunion and get some much needed face to face time with my loved ones! 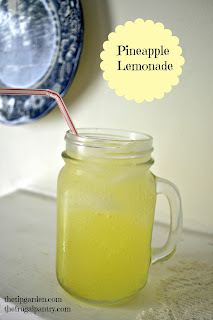 While I am gone I am leaving you with a fun recipe for homemade Pineapple Lemonade. It is a refreshing twist on traditional lemonade, and is easy to make and super tasty. Perfect for your family cookout. I look forward to reconnecting with you next week! Enjoy your Independence Day celebrations!